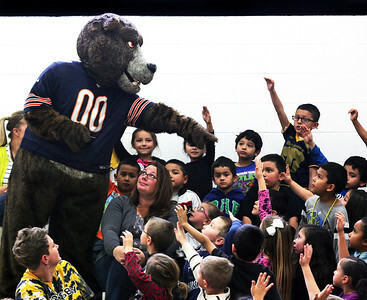 H. Rick Bamman - hbamman@shawmedia.com Chicago Bear mascot Staley chooses a volunteer from Crosby Elementary School students during the Bear Down on Bullies program on Wednesday, Nov. 26, 2014. Staley and MC Lauren Hart presented the program that teaches the importance of respect, how to deal with and prevent bullying. H. Rick Bamman - hbamman@shawmedia.com Chicago Bear mascot Staley greets Crosby Elementary School students after the Bear Down on Bullies program recently in Harvard. Staley and MC Lauren Hart presented the program that teaches the importance of respect, how to deal with and prevent bullying. 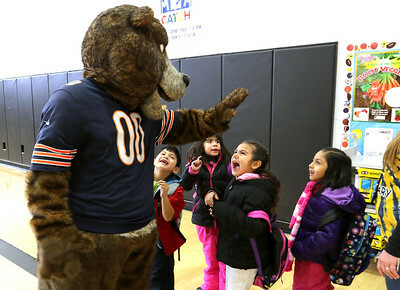 Chicago Bear mascot Staley chooses a volunteer from Crosby Elementary School students during the Bear Down on Bullies program on Wednesday, Nov. 26, 2014. Staley and MC Lauren Hart presented the program that teaches the importance of respect, how to deal with and prevent bullying.